Pic 1: - Right from the start something feels out of place. That thing is the size of the packaging. 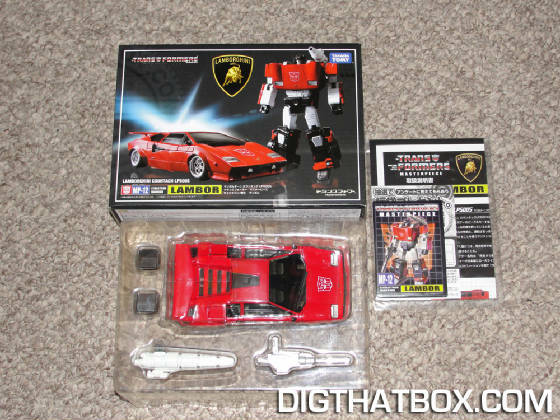 Lambor's box virtually the same width as G1 Sideswipe's box. I was very worried that I just got ripped off or "Punked" or something. Pic 2: - Inside, things were marginally better. Lambor's toy does take up most of the tray, and he comes with 4 well layed-out accessories. 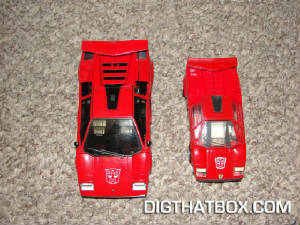 Pic 3-5: - Comparing Lambor to G1 Sideswipe in person started to show the real work that's gone into this mold. The sculpt is vastly improved, with all curves looking far better than the G1 toy. 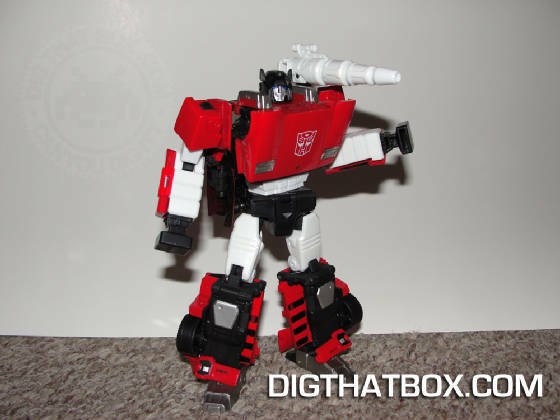 MP-12's paint apps are far superior to the G1's decals. 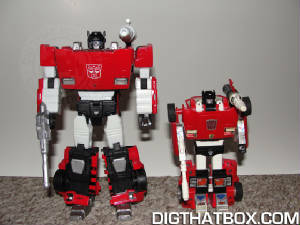 Don't get me wrong, I still love G1 Sideswipe. 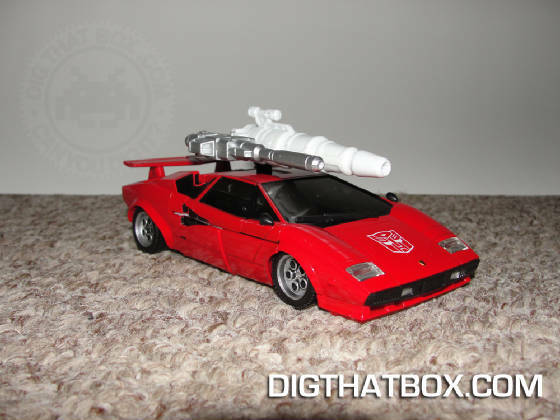 But just imagine being a kid in the 80's and bringing MP-12 to school for your friends to drool at! That's not to say everything is wine and roses. Panel gaps on the doors are impossible to hide, the tailpipes look like an afterthought and the vehicle interior is nonexistant. 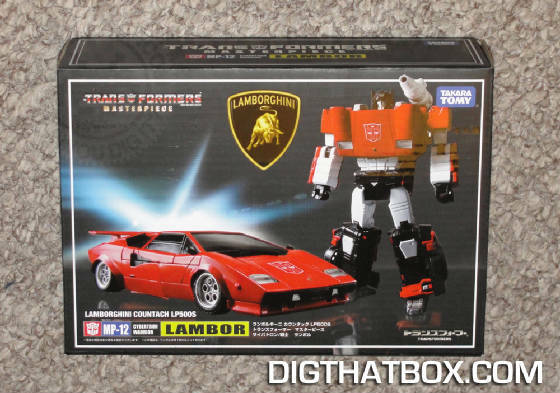 Lambor is not an Alternator or Binaltech figure, but I really do expect more from a Masterpiece. I would like to say in my defense that I was a kid when I painted this back in 1985. The taillight stickers were gonners after just a few weeks of light play. I acted out of distress...and probably a contact high from modeling paint fumes. Pic 6: - The weapons peg together and can be attached to the roof by pushing on the black square panel hidden in Lambor's roof. I can't say this is my favorite gimmick. 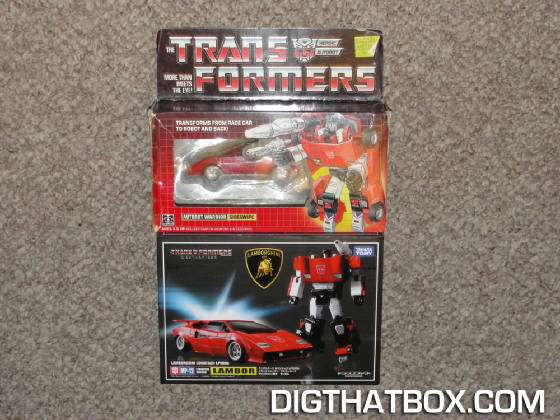 I think omitting the "hidden" square would have helped the alt mode. 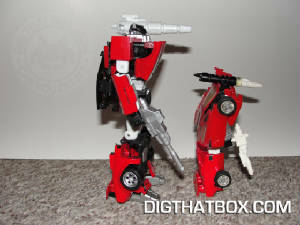 Pics 7-10: - Transformation to Robot mode is quite a bit different from G1 sideswipe. Although parts are in roughly the same areas (doors become arms, rear becomes legs), they are manipulated quite differently. 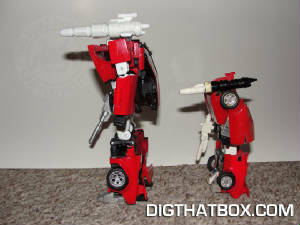 For example, the lower legs are created by flipping the cars rear panels around, much like Alternity Convoy. I do like his transformation, although the hollow legs bother me a bit. That said, robot Mode, like all the Masterpiece toys, is this mold's strong suit. 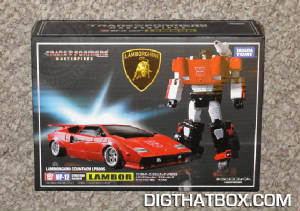 Lambor is VERY well proportioned, with a far greater range of motion than G1 Sideswipe (who has very limited articulation in his arms, elbows, head and nothing else). Lambor's detailing is excellent, with the back of the legs mirroring the engine vents on the G1 even though the detail is unnecessary for the alt-mode. 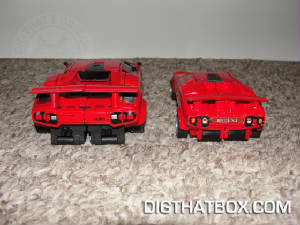 Every area such as the blocky arms are much more cartoon accurate, yet G1 Sideswipe toy details such as missile launcher nubs, back plate shape, upper shin stickers and alt-mode spoiler location are all paid homage to. Pic 11: - Lambor can sport his piledrivers from G1's "Fire on the Mountain". 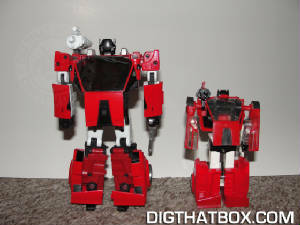 They're neat additions that don't negatively impact either alt or robot mode (unlike the black panel mentioned in Pic 6). It's obvious that robot mode is the priority in all the Masterpiece designs. I just wish there was an Alternators level of detail and functionality in Alt mode to compliment the Robot mode's near-perfection. 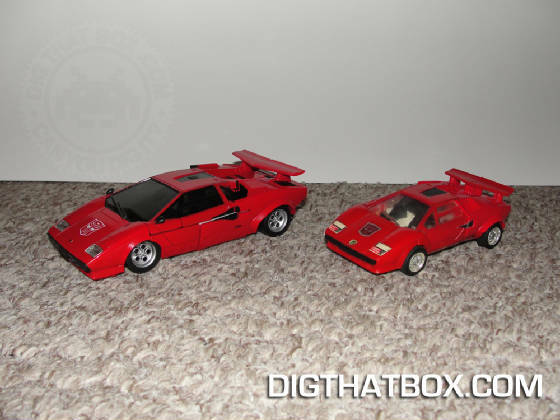 Then again, most collectors will keep this displayed in robot mode, so it may be a moot point. In closing, I feel like a broken record with every Masterpiece toy I've reviewed. Great mold. Robot's better than Alt mode. Very expensive. Casual collectors should wait for the inevitable US release. What else is there to say?